Tigger Plush Comforter. Tigger features a cute blanket with a checked orange and white underneath, with a little caterpillar. This gorgeous plush comforter will help sooth your little one. BNWT Primark Disney Dumbo Elephant BABY COMFORTER BLANKET COMFORT SNUGGLY. Lovely comforter, white with multi coloured stars with Dumbos head on top. Condition is New. Dispatched with Royal Mail 2nd Class. Disney Baby Finding Dory Baby Comforter. Super soft Disney Dory Comforter. Official Disney. In the unlikely event that you receive a faulty item, we are here to help. Parents, gift buyers and baby alike will be smitten by the super soft plush Dumbo toy holding a baby-soft comforter. Disney’s most famous elephant, Dumbo as a plush character holding a comfort blanket, is the perfect companion for little ones to cuddle up with at storytime, naptime and bedtime. The tactile features include Dumbo’s distinctively large floppy ears, and unmistakable yellow and orange circus ruffle and hat. The Dumbo Holding Comforter toy is safe from birth and makes the ideal gift for a baby shower, to mark the arrival of a newborn or as a gift for an infant. Disney Winnie the Pooh Comforter. Winnie the Pooh holding his cream blanket. from Hallmark. Olaf glow in the dark. Ready to gift. FROM THE WINNIE THE POOH BOOK BY A.A. MILNE. SOFT GOOD MORNING RATTLE. BEAUTFULY SOFT PLUSH FABRIC WITH A SOFT RATTLE WHEN SHAKEN. LOVELY WHINNE THE POOH. A LOVELY FIRST SOFT TOY EASY FOR BABY TO HOLD FOR BOY OR GIRL. Disney Baby Mickey Mouse Twist & Learn. 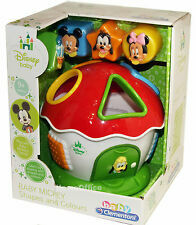 Cute electronic and interactive Baby Disney character with sounds and lights. Official Disney. In the unlikely event that you receive a faulty item, we are here to help. 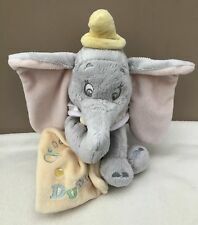 You are looking at an official genuine Disney Dumbo plush ring rattle The youngest fans can embrace Dumbo fever thanks to the high quality plush Disney Baby Dumbo Ring Rattle. This classic baby toy stars Disney's most famous elephant and features Dumbo's baby-soft plush face on a plush ring rattle with a stimulating chime rattle to encourage sensory play. The Dumbo Ring Rattle is suitable from birth and makes the perfect gift for a baby shower or to mark the arrival of a newborn. The beautiful detailing includes Dumbo's distinctively large floppy ears, and unmistakable yellow and orange circus ruffle and hat. 17cm tall, Comes presented on Disney branded swing card with hologram of authenticity attached. This Harmonica would make an ideal present for your child. 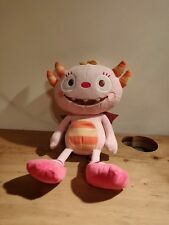 For ages 3 years Size: 27x16cm/10.8''x6.4'' Brand New in Box. Fun toys include a spinning ball with colorful beads, a heart shaped mirror for self-discovery, Minnie Mouse bead chaser toy, and tactile leaf stalk. The Minnie Mouse Peek-a-Boo Activity Jumper is EAR-resistably fun for your little one! A Winnie The Pooh rattle gift set for little ones to wear and enjoy! Featuring stripy socks with a 3D Pooh Bear head, along with a Pooh Bear rattle with embroidered stars and a sweet scarf tied around his neck. DISNEY STORE BABY RATTLE COMFORTER LION KING SIMBA SOFT TOY. This lovely little plush rattle is in excellent condition and perfect for any little one. This is official Disney Store merchandise. From a smoke free home. Disney Baby Winnie The Pooh Rattle Comforter. Pre-owned but in very good condition. Disney baby Piglet Comforter Blankie in lovely condition Dispatched with Royal Mail 2nd Class. There are 13 pieces which make up 4 jigsaws – so they are easy to do! You can keep the jigsaws in the net when not being used too. Disney Baby Mickey Mouse Activity Rattle. Official Disney. In the unlikely event that you receive a faulty item, we are here to help. Each Comfort Blanket is presented on an illustrated backing card and is safe from birth. Finding Dory Projector Torch. 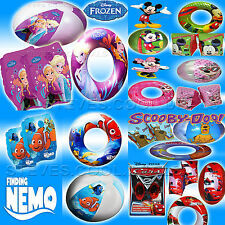 Dory, Nemo and so many more! Simply light up the amazing images on the wall or ceiling to discover your favorite aquatic characters. Disney Baby Finding Dory Baby Rattle. Super soft Disney Dory Rattle. Official Disney. In the unlikely event that you receive a faulty item, we are here to help. I have for sale this lovely bundle of baby soft toys. They are in great condition. Please see my pictures. Many more Baby Snuggie's HERE. New listingDisney Winnie The Pooh So Loveable Cream Comforter. Disney Winnie The Pooh Comforter.